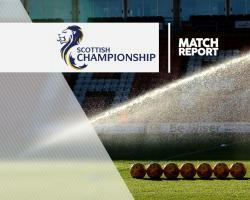 St Mirren guaranteed their Ladbrokes Scottish Championship status as they drew 1-1 away at champions Hibernian. Rory Loy's second-half equaliser ensured St Mirren avoided a place in the relegation play-offs. Hibs, who already had the title wrapped up, took the lead in the 49th minute through Grant Holt's volley as Neil Lennon's side finished the campaign with a 11-point gap over second-placed Falkirk. After a subdued opening 45 minutes the hosts went in front as former Norwich striker Holt volleyed in from close range from John McGinn's cross. But the visitors deservedly drew level on the hour mark as Loy found space in the Hibernian box before slotting past goalkeeper Ofir Marciano. Hibs forward Martin Boyle's speculative volley from the edge of the area was well saved by Billy O'Brien, who managed to recover the rebound from the feet of Jason Cummings.